Sooooo many subscription box services, so little time! Come to think of it…I do have time. The question these days is more of: what makes you stand out? A+ for packaging. Seriously. I don’t need interesting art, I need the content to be good. I like how bare bones this one is, and I really love how the box is just barely big enough to fit all the goodness inside. Well alright, alright. This is actually interesting. Let’s go to a clearer shot of the goods. Take a look. 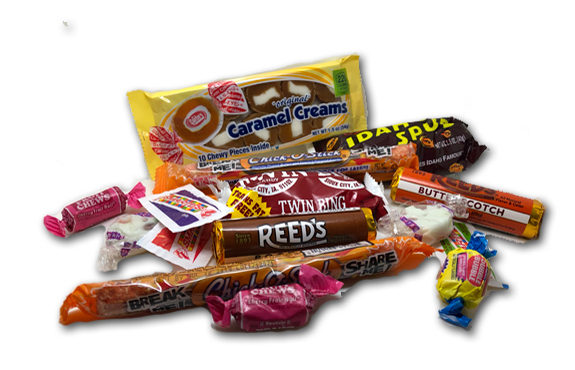 We have the Idaho Spud, Goetz’s Caramel Creams, Twin Bing, Chick-O-Stick, and two kinds of Reed’s hard candies. And I’m gonna stop right there. Why? Because this actually IS badass nostalgic candy. 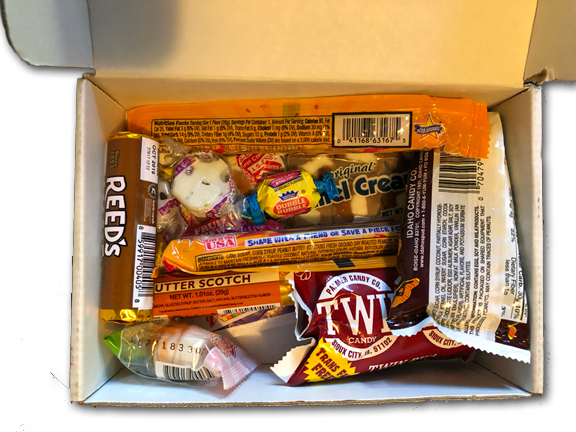 Sure, they included Double Bubble Gum, Sweetarts, Tootsie fruit chews & some Brach’s individually wrapped candies, and those are fine, but the stuff I mentioned before truly is American iconic old school candy. 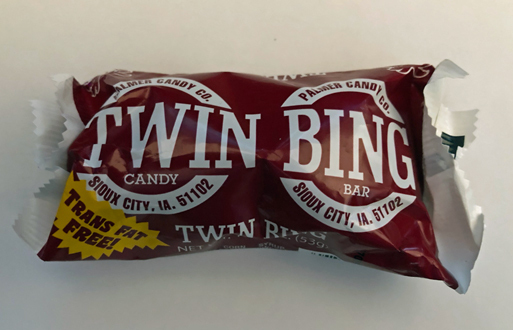 You cannot (usually) walk into your local candy store-if you have one-and get a Twin Bing. 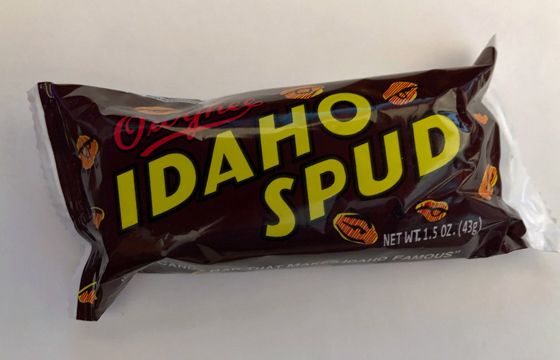 Finding an Idaho Spud? Not easy. 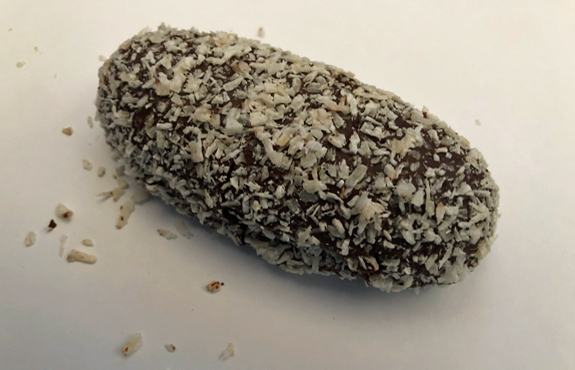 Let’s take a quick break to look at the Idaho Spud. 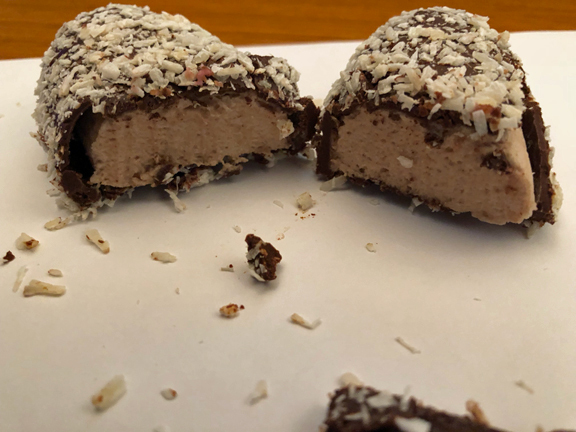 Coconut covered chocolate over a marshmallow center. Honestly…they’re not super great. Definitely not bad, but a little flat for me. 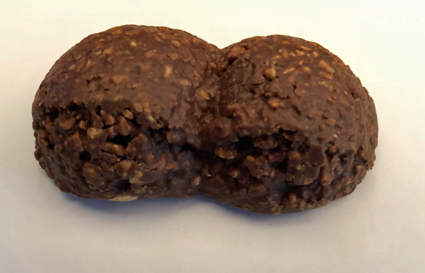 But the Twin Bing…now that’s a different story. Whoah. Kinda weird looking but…so am I so I can’t judge. Ok this is new. 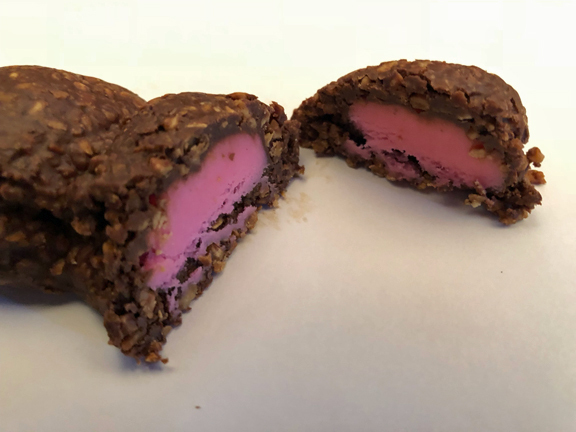 What’s going on is peanut chunks in chocolate covering a cherry nougaty center. At first, you get a 100% peanut butter thing. It really tastes like a peanut butter candy. Soon though, a subtle cherry wave comes in and….it’s delicious. Rich, decadent, a bit salty and unique. I really liked this one. We’re dealing with nostalgia here, and when it comes to that, the only thing that’s important is that it’s actually the same exact thing that it was back in the day. And this all is. I remember Reed’s hard candies from spending time with my Grandfather in Philly as a kid. I didn’t discover chick-o-sticks till I was in my 20’s but that still counts. This is a box of good stuff. Except…and I hate to do this….but I’m questioning one piece that was included. I’m questioning how this could be considered nostalgic. 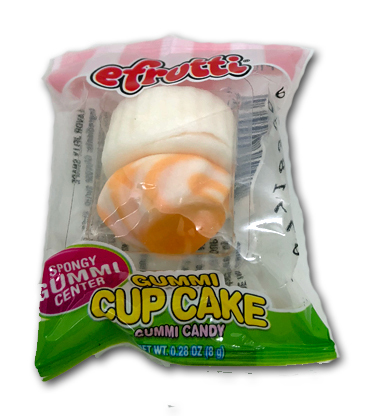 Maybe I’m wrong, but…gummi cupcakes? I’m pretty sure these haven’t been around that long, and I’m also pretty sure that literally no one in the world likes them. But again, I DON’T KNOW EVERYTHING. But I do know a lot about candy, and this feels like a misfire. Even so though, who cares? 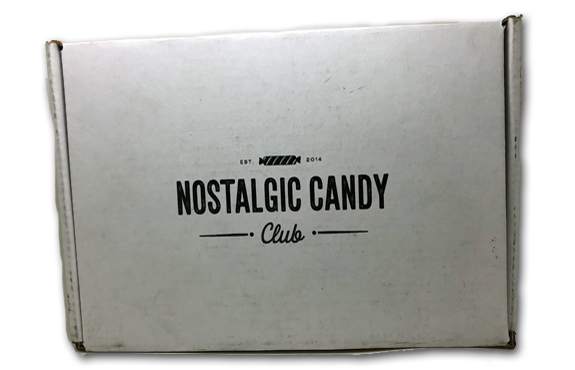 The box is crammed full with quality nostalgic treats, and that’s just this month’s box. Who can dream of what next month’s holds? 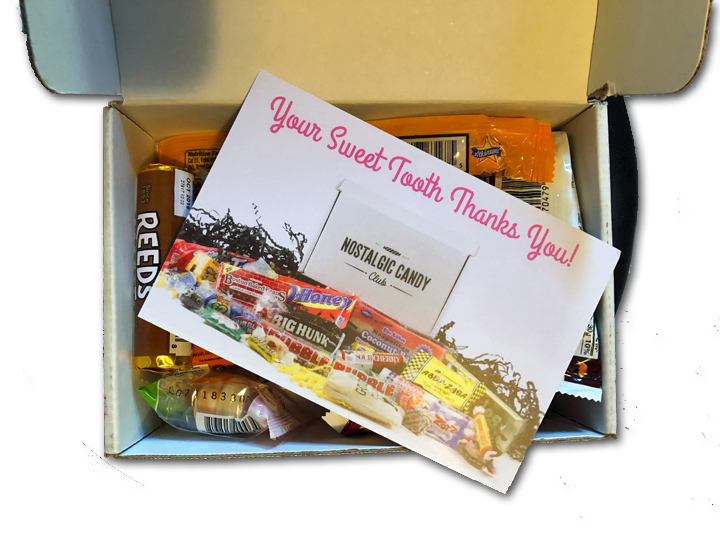 This is a very cool gift for the not super young candy lover in your life, or for the youngest that needs an education. Cruise over to the link we’ve included and check them out. In a world of too many subscription boxes, this one stands out. Boxes of candy. I mean you get 2 stars just for doing that.